The sinking, color-enhancing version of our Super Kelp Pellets. 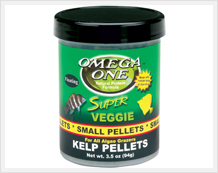 Perfect for picky algae grazers, these pellets contain the freshest ocean kelp available. How do we know? Because we harvest it ourselves off the rocky coasts of Southeast Alaska. Loaded with critical minerals and trace elements and an even higher level of color-enhancement, this is a veggie food like no other! INGREDIENTS: Whole Kelp, Spirulina, Whole Samlon, Halibut, Whole Shrimp Wheat Flour, Wheat Gluten, Fresh Kelp, Lecithin, Astaxanthin, Zeaxanthin, L-Ascorbyl-2-Phosphate (Source of Vitamin C), Natural and Artificial Colors, Vitamin A Acetate, Vitamin D3 Supplement, Vitamin E Supplement, Vitamin B12 Supplement, Riboflavin, Niacin, Pantothenic Acid, Choline Chloride, Folic Acid, Biotin, Inositol, Tocopherol (Preservative), Ethoxyquin (Preservative).